A story of drug and alcohol abuse and rehabilitation as it has never been told before. Recounted in visceral, kinetic prose, and crafted with a forthrightness that rejects piety, cynicism, and self-pity, it brings us face-to-face with a provocative new understanding of the nature of addiction and the meaning of recovery. By the time he entered a drug and alcohol treatment facility, James Frey had taken his addictions to near-deadly extremes. He had so thoroughly ravaged his body that the facilityís doctors were shocked he was still alive. The ensuing torments of detoxification and withdrawal, and the never-ending urge to use chemicals, are captured with a vitality and directness that recalls the seminal eye-opening power of William Burroughsís Junky. 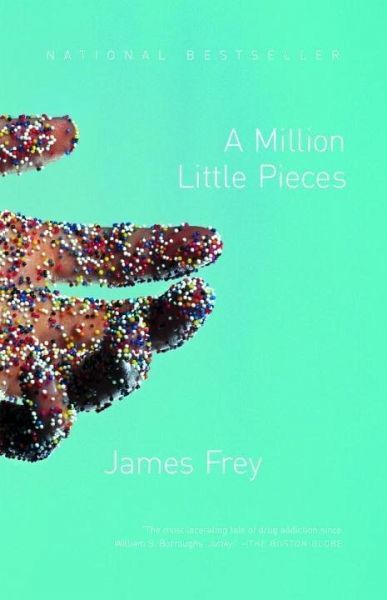 But A Million Little Pieces refuses to fit any mold of drug literature. Inside the clinic, James is surrounded by patients as troubled as he is -- including a judge, a mobster, a one-time world-champion boxer, and a fragile former prostitute to whom he is not allowed to speak ó but their friendship and advice strikes James as stronger and truer than the clinicís droning dogma of How to Recover. James refuses to consider himself a victim of anything but his own bad decisions, and insists on accepting sole accountability for the person he has been and the person he may become--which runs directly counter to his counselors' recipes for recovery. James has to fight to find his own way to confront the consequences of the life he has lived so far, and to determine what future, if any, he holds. It is this fight, told with the charismatic energy and power of One Flew over the Cuckoo's Nest, that is at the heart of A Million Little Pieces: the fight between one young manís will and the ever-tempting chemical trip to oblivion, the fight to survive on his own terms, for reasons close to his own heart. A Million Little Pieces is an uncommonly genuine account of a life destroyed and a life reconstructed. It is also the introduction of a bold and talented literary voice.